The “Let’s Change School” conversation came to the forefront again this week after a video collaboration between Ted Dintersmith and the rapper Prince Ea went viral. As we write this, the video has been up for a little over 4 days, and between YouTube and Facebook, it has almost 10 million views and over 25,000 comments. We think that qualifies as viral. Why would a video about the need to change school go viral? Why is this particular video zooming around the Interwebs at warp speed? Is it the high production value? The captivating spoken poetry by a well followed You Tube talent? The cute kids? All of the above? Because almost everyone can relate. With the caveat that at moments the video is a bit hyperbolic, a little too self-serving, and tries too hard for that emotional response (a couple of my friends called it “icky”) – despite all that, which of the messages embedded in the video shock you? Haven’t we already acknowledged that kids don’t have a ton of real life skills when they graduate from high school and that in general they forget most of what they “learn”? Don’t we already recognize that school is more or less a game kids play to see how many As they can collect and many only care about what’s on the test? We see schools that are driven by compliance and high-stakes assessments, yet we know that all sorts of amazingly complex, beautiful, meaningful things in this world were created by people who took vastly different educational paths than those offered to most of our children. And so while not surprised by the content of this video, its message can certainly spark within us the need to act. To lead with courage. We know that schools have incredible value to our youth and the future of our society, and that teachers are powerfully important people in kids’ lives. So while we’ve been writing and speaking about these “viral” themes for years, we’ve also been to schools who have not only acknowledged what’s wrong with traditional systems of schooling, but they’ve acted to transform the learning experience for their kids. They’d listen to Prince Ea’s messages, yet be unable to identify such difficulties in their own schools. So, what is school for? The “What is School For?” question gets to the very heart of what we’re talking about in Change School and our Modern Learners Community (MLC). And what’s been cool to see is that we can have these hard conversations together in ways that lead to the types of changes that would render that video irrelevant. They are conversations about what real learning looks like, the gaps between what we believe and what we do in classrooms, our understanding of how the world is changing in all its many complex ways, and how we develop cultures of trust and fearlessness and innovation. We seek understanding and grapple with these existential questions in a safe online environment separate from the all the distraction and divisiveness that is social media. We created Change School and MLC so we could go there together. So we could be guided by each other’s wisdom, experiences, struggles, successes. 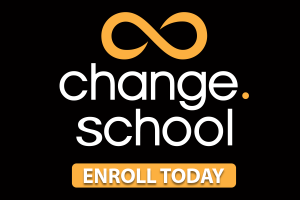 In Change School we stay connected to those heavy conversations over the long haul in ways that lead to big steps toward real change. We do more than take small incremental steps as suggested because…small steps aren’t enough for our kids. We can’t lose a generation of kids because of the pace of our change. The world will not wait. We are inspired by what Change School alumni are doing. John Clements and Mary Ann Moran and their team at Nipmuc High School have created a comprehensive roadmap for change. It’s a year of planned collaboration to determine their core values, beliefs about learning, and the future of learning at Nipmuc. SGI is making bold moves. Superintendent, Kim Moritz, Director of Technology, JoAnn DePue, and Board member, Allison Duwe, are committed to giving their learners permission to take risks and protection when mistakes happen, and the board is committed to removing barriers through policy reduction. Mark Heintz is a Divisional Technology Coach and teacher at Elk Grove High School in Illinois. Mark writes about “Letting Go” in his must-read Collab Lab blog in which he helps teachers understand both sides of the learning interaction in classrooms. The conversations were amazing. The students saw that learning should change you and be a personal struggle. One of the things I had to point out to them, even though they wrote it down, was that teachers should listen. They were taken aback by that. Teachers are learners, too. If I am going to be less of a planner, I need to listen a lot more. Ready to make relevant, sustainable change in your school? 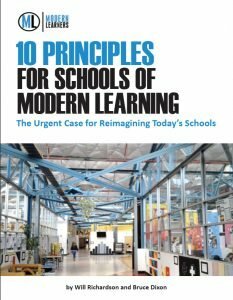 We invite you to read and share our 10 Principles for Schools of Modern Learning whitepaper. We give you a framework, insights, action steps and links to curated resources for developing kids who are deep, powerful learners. These 10 principles offer a guide to creating real change in schools. Great! The whitepaper will arrive in your inbox very soon! School- when I gave this word to my students for word association, many came up with words like table, chair, chalk, blackboard, boring,subjects, tests while the privileged few came up with words like fun, activities, play, friends and names of teachers We ‘know’ change is required at a global level and we have shouted it loud from the highest mountain tops of social media but what are we doing at the ground level? We have identified the problem now we need to develop videos on ‘ how to’ bring about that change starting right from kindergarten or even prior to that.The mindset of an entire human race has to change not just the school, teachers or students. Let’s begin with the timetable- responsibility, honesty, sincerity, integrity, care, love respect have to be included as a serious subjects. An interaction with pencil, crayon, paints or pen on paper may be included in the timetable, meditation or a period of silence, a period on self expression, a period based on fun and interest of the child- I try to incorporate all these at my mini level of my own school (activity center) which I have started in my house and children love it so do the parents. *Mind and ME* is my dream for the children of this world who become kind,responsible and independent thinkers of tomorrow. Thanks so much for sharing your thoughts here in the comments. What you describe is certainly an experience many of us would want for the children in our lives. In your experience, what would have to happen in order for these changes to occur at “the ground” level? What non-negotiables would have to be in place? Thank you so much for even giving a sort of attention to my thoughts. I feel on top of the world. As this is what sinks my heart the most when I attend workshops, seminars and talks- no one is interested in improving schooling. The moment I introduce myself as a proud teacher, literally everyone starts looking beyond me or ignoring me completely. Teachers or the teacher communities are such a put off for the majority of the population out there. I want to change this attitude. Unless we bring, respect, love, innovation ,attraction and creativity into this vocation of teaching, there will never ever be any motivation or newness in schools.Oops!! I seem to sound a little preachy here but I speak from heart and I feel that’s what people resonate with the most. Thank you so much for resonating with my thoughts. *Training of teachers- This is a daunting task because none of us ( that includes me first) is trained to carry out an ambiguous curriculum like this. school is a waist of time. yes there are really amazing teachers and pricipels and students out there. there is a big problem, the problem is that we are taught about usless information that will not help us. When you finish school, will you actually know important things that will actually help you in the real world. So, when you learn the phythagory theorem, how mitrogondriga is the power house of the cell or factors and trinomials. Have you ever thought about how this will actually help you in life. I know many of you have asked this question WHAT IS SCHOOL FOR whether you asked yourself or a teacher a parent, most of you have asked this question. But this question never ever gets the correct answer, yes a teacher might give you an answer but it is never the right answer. Excuse me if I’m not making much sense. But It will later on. You all spend so much time at school, get loads of homework, a bunch of projects due at the end of the week and never know how to manage it all. But were you could be taught time management skills, but you don’t get taught that. Lets say this is one of the most important things in life okay, so if it is why do we never get taught this in school, or how to deal with communication problems but there is one funny thing here, it is that I have to be very careful about what I say now because I cant say we were never taught how to deal with peer pressure, I don’t thing a LO teacher would like that because we are taught that but there are many things we are not taught, and teaching us about rocks, the solar system, Cecil john rodes, how on the 30th of may 1945 Germany surrendered, mechanical advantages, how government systems work in different areas, or how some guy presents an 8 hour speech on economical issues or something like that and it takes him 3 months to write. What good will knowing all this do for us, how will this help in being successful in the future. But teachers would say it will. Yes its good to know about the solar system or how rocks form, but its only going to help you if you are a scientist who study’s the solar system or rocks or whatever, there is no use for that if you are an accountant or a carpenter. But yes I know at the end of grade 9 you choose your subjects that will determine what you study for in grades 10,11 and 12. But come on. We should be learning less about the civil wars, or geometry of straight lines or how the eye works and etc. All that information is only good if you have a job that requires that certain knowledge, is it not? We should be learning communication, how to handle depression, how to handle suicidal thoughts that in some cases eventually turn into suicide attempts, how to handle difficult people in order to get the task done and have everyone including you happy in the end result, how to take care of yourself emotionally and physically, how to take proper care of your mental health and ect. Before I go on with all that. There is one thing that I think is one of the worst things in school to ask a teacher and to receive the answer no. it is this simple question may I please go to the bathroom. So we have to ask permission to relive bodly functions but not before the teacher asks a million questions like, why didn’t you go before class, sorry but my bladder is kind of on its own schedule and its not always on a time limit. Teachers always say use your time wisely but do you know all the hours we spend at school each day might literally be the worse use of time management ever in history. Now as I was saying before is that the point I was trying to make is that there are better and more important things that will actually have a good impact on our lives now and help us in the future. But we never get taught those more important things now do we? Now we may all have different answers to that question but from my point of view my answer would simply be NO. So school crams information in your head, force feeding you and the you through it up on the test. School teaches you how to memorize dots true education should teach you how to connect them. True education teaches you how to catch a fish, school teaches you yea you caught the fish but you didn’t show your work so it doesn’t count, through it back. Do you know how many dreams are lost in school and how much potential is wasted? I wont you to close your eyes and imagine a child sitting at the back of some teachers classroom, in some town, he never raises his hand, he fails most of his classes but inside of him there is a passion and if nurtured and brought out will lead him to discover the cure for cancer. But you see I’m afraid that, that child’s gift will never come out, he will never win the Nobile prize, because in class he was ignored and his worth was judged only by his scores. So teachers, principles, parents and students I ask WHAT IS SCHOOL FOR? So I hope this has you all thinking and please know I am not just talking to the students I am also talking to every person sitting her today in this hall. School should be a place to wonder – what is life about? What is out there beyond what we can see – beyond the sky and the stars? The deepest parts of the ocean and vast seas? What is within each of us -our souls and dreams and imagination? What is time and eternity and consciousness and being? School should be a meeting place for people -multi-generational, wanting to change their community so that it promotes equity and compassion and the good of all. School should be a place to collaborate, engage, create, problem-solve, ask more questions, listen for more answers, design – ALL to also deal with what threatens civilization, our common sense of decency, and humanity, and the planet itself and life in it. School should lead children to plant trees, grow food, clean waterways, rid the planet of toxins and the plastics and chemicals that created them. School should teach children to listen, meditate, relax, dance, express themselves in art, music, poetry, theatre, film, photography and technology, travel and community service (hospice, clinics/hospitals, birthing centers, daycare centers, prisons, bereavement centers, psychiatric wards, suicide prevention center, drug rehabilitation, veterans clinic, depression clinics etc). School is where we may discover who we are and what we are here for. “School is where we may discover who we are and what we are here for.” This is a beautiful sentiment, Rowena! So glad you shared your comment with us. How can we start to lead others in establishing learning experiences that will help children realize who they are and what their place in the world can be? I came to teaching a bit late…this is my 5h year at it and I’m 46 (white male, btw). I’ve been involved in the effort to answer this question since my 2nd year, so I’m all in, I’m a believer in both the need for and power off the change we’re all looking for. In fact, the main course I teach is one we created for this very purpose — to change how we we teach and learn so that students develop the habits and dispositions and *inclination* to take greater responsibility for their own learning. Every 9th grader at our school takes it. Students (not every student, of course, but certainly the majority of mine) appear unwilling to devote the emotional labor (read: hard work) necessary to do school differently. Ask any of them if they’d like to decide what they learn about in school and they’ll say yes. But follow that up by providing them opportunities to do just that and they revert to, ‘just tell me what to do’. Perhaps it’s the demographic of our school (very low socioeconomic, large language learner population, etc) and others don’t face this problem. I don’t know. It’s the only place I’ve taught. And maybe it’s just the inertia of what’s been done to them over the previous. 8-10 years of school. I’m not blaming them, but I think it’s critical that those of us having this conversation acknowledge that it’s not enough for a teacher, or even a school, to make this commitment to change. To pass the baton. Students and families have to be willing to take that baton and do their part. Run their portion of the race. As members of this society, we all have a part to play here, so putting the onus completely on schools and teachers isn’t sufficient. “I think we should play Fortnte’, is not acceptable answer. Nor is ‘I don’t know’, with the accompanying shoulder shrug. I really do believe that perhaps my most important job as a teacher is to get kids to care. To help them see why this thing they spend 12+ years of their lives dong matters. But the transition away from tradition has revealed an apathy in students that, frankly, I wasn’t prepared for. And I struggle daily with how to deal with it. If anyone has any substantive thoughts on that, I’d be grateful. They’ve grown up accustomed to “playing school.” They want to do what they need to do to earn a mark or pass the test. And that’s a huge concern we have, and something we’re trying to figure out how to lead and help others try to “undo” in their current organizations. What concrete changes will we have to make with all stakeholders, not just teachers and students, to help students learn to love learning, and not be entirely motivated by marks? Would love to hear the kinds of things that are working for you in your classroom! Your comment really touched me. I think there are a great many of us who struggle with the same issues you expressed. One of the great pleasures I’ve had during 2018 is the opportunity to hear Christopher Emdin speak, and to read his book “For White Folks Who Teach in the Hood — and the Rest of Y’all Too: Reality Pedagogy and Urban Education”. It addresses head on the question of meaningful strategies to engage today’s high school students. I can’t recommend it highly enough. Jim, thanks for your comments and for the book recommendation! I feel like the video is a bit misguided and should really be asking, “What is testing for?” There is value in going to school. Striving to have new and innovative ways to teach is not new. I have been in education for 35 years and seen this topic discussed many many times. We have Montesorri schools and charter schools and GT programs and project based classes and many many other ideas of changing up schools. From what I have seen, however, schools have gotten less creative in the past decade because of the push for assessment. The testing culture (which is a big business making a whole lot of money off of student and teacher stress) has taken the creativity out of our public schools and forced educators to teach to a test in order to keep their jobs. Until our society, policy makers (often politicians who do not want to see progress nor change) and school boards and parents and college admissions and students all get on board to understand the value of education in both the academic and life skills areas, as well as the importance of the arts and music in our world, change will be difficult. We cannot desert the public school philosophy as every child deserves an education. If the changes we seek and hope for are only in the private and privileged schools, we will only continue to widen the gap between the haves and the have nots. Overwhelmingly, the teachers and school leaders we talk to admit to being fearful about change because they feel responsible and accountable to “a test.” Whether it’s statewide standardized testing or accountability measures they’ve placed upon themselves, we see data-driven decision making driving ALL of the wrong decisions in schools. We see value placed on things that truly don’t matter that much. The thing is, there are schools that are breaking free of the accountability structures that other schools perceive as holding them back. They’re not getting excluded from the tests, and they’re not waiting for politicians to change their mandates before acting – they’re just doing it. They’re not letting high-stakes testing policies define who they are or what they believe to be true about learning. And these schools are finding that when they place emphasis on all the right things: learner and professional autonomy, inquiry approaches to learning and authentic assessment – when they focus on these things, the test “scores” take care of themselves. But you’re correct that this should be a team effort -we need to band together with stakeholders at all levels, especially parents, to bring the changes we know are necessary to life. Prince Ea makes many valid points about what is still, unfortunately, the status quo in many classrooms. He and Richardson seem to share many ideas about the necessity for change in schools. I’d love to see them collaborate in some way. Hey, Mary! We’d love to see that, too! We’ve invited Prince Ea into our Modern Learners Community for a chat, and we’re hoping he’ll take us up on it! Thanks for your comment! I’m only a freshman in high school so this article and prince ea’s video really really put something in my head to think about. I had always gone to school and wondered, “why don’t they teach us life skills like cooking or doing taxes or that?” I was also really interested in that fact where he said if suicide is the 3rd leading cause of death from 10 to 24 then why aren’t we taught how to handle ourselves or stress? EXACTLY. these things happen all the time and the teachers and school community just puts a memory page in the yearbook and continues the stress not even knowing that that stress could possibly contribute to the suicide. After seeing that video (and, “i sued the school system”), I had great hope and feeling that schools around this country would finally start listening to the message and making a change that can completely change kids for the better. I’m really hoping that becomes a thing everywhere in the US like it has in other countries already. And since it has in other countries and those countries have the highest education levels in the world, its obviously possible in the US right?? I mean they want us to have education so the US really needs to listen to those countries. So I have one more question. How is the US looking in terms of making a change? Is it possible for most of the country to change soon? CAN WE DO IT? your whole article sends such a negative vibe. Prince EA did an amazing job in reaching many different people about the realities of schooling and what has not changed at all. this article was to promote you and your set of opinions instead of acknowledging the fact that someone finally made something that we all agree on go viral and reach millions. He acknowledged that not all schools are like that in the commentary of the video, but the generalization still stands. If the schools you know can’t relate to the video, good! whatever. The video was to mainly open the eyes to what children have been saying for YEARS. He did an amazing job. This article is what’s icky. Next. the education system around the world. I sincerely hope ‘Change School’ will give its Midas touch to every school right from kindergarten. I don’t think school is for anything but to get us out of the house for a little bit because he’s right schools are not teaching anything that students deal with on a daily bases. Students don’t learn anything in school but what happen in the past and that’s not helping them in life. Students need to be learning about depression, suicide and time management that’s what students need to know and understand not math or science. Students need to know about how to buy a house, a car, and insurance because that’s what students need in life not what equal’s X.